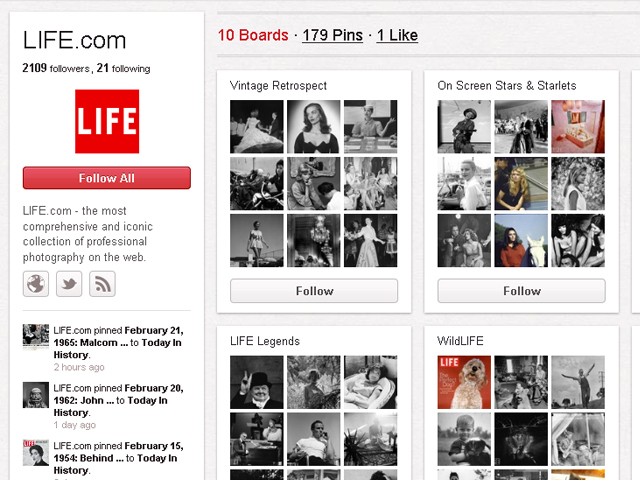 (CBS) - Pinterest is a social network where people make image boards to share photos in a collection. When an image is "pinned," it goes to a main feed where other people can either re-pin the image or follow the user or board. Here are some samples of unique ways people are using Pinterest. The New York Public Library, Art and Picture Collection has so many cool boards. They've rounded up examples of online stereographs and a collection of photos with the aesthetically pleasing golden ratio 1.6180339887. The Paris Review pinned covers of the literary journal going back to its first issue in 1953. The Perfect Palette has a wide range of color palettes. The Nature Conservancy has a quirky board highlighting the bizarre examples of love in the wild. Life revs up the nostalgia with vintage photos straight out of the pages of Life magazine. Pinterest user Amy Leader has a unique collection of historical periods, from Victorian to 1960s. RetroLifestyle has a cool collection of vintage film and band posters. The SF Moma has a boards inspired by love, sunlight and California. Archives of American Art has a cool collection of photos of American artists as children. Serious Eats is serious about food. These boards will make you salivate. The New York Botanical Gardens has a beautiful collection of flowers. Artspace has a range of boards inspired by typography, love and floral prints. Pinterest user Jen Rubio pinned all things pins! From rolling pins to wrestling pins, these collection of boards will give you a chuckle.